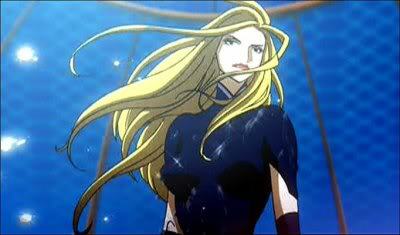 Britney Anime? | Sugoi Stuff Britney Anime? Home » Arts and Culture » Britney Anime? 2008 Britney Spears? Definitely not Sugoi. Animated version of Toxic? I guess anything other than the crazy Britney Spears would be sugoi in my book. SunUK has some pics of her upcoming video Break The Ice. The audacious promo to forthcoming single Break The Ice is set in a futuristic world, and sees Brit depicted as a pretty, slim line superhero. Hmm… I don’t recall the Toxic video having those scenes. Let’s just wait and see how this video turns out. Britney Spears goes GI Jane! Catch the Genius webcam promo! Also, is the video playing on TV yet?